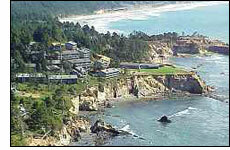 Oregon Coast Hotels, Motels, Bed & Breakfasts and Resorts. Bed and Breakfasts offer short-term lodging in private homes. Looking for lodging and accommodations on the Oregon Coast? In addition to excellent rates on Newport hotel reservations, we offer detailed information on a variety of other lodging and accomodations. We now offer lodging along the entire length of the Oregon coast.